Two state legislators — one Republican and one Democrat — are being honored with the 2013 Herbert Hoover Uncommon Public Service Award. Republican Representative Dave Heaton of Mount Pleasant received the award during a ceremony in the Iowa House this morning. Heaton, who is 72 years old, owned the Iris Restaurant in Mount Pleasant. He has served in the Iowa House since 1995. Heaton is the long-time leader of the panel that writest the budget for the Department of Human Services. Representative Mark Smith, a Democrat from Marshalltown, called Heaton a “quiet” leader. “Through his work and humble leadership, he inspired other legislators to greatness and achieves monumental changes for the State of Iowa,” Smith said this morning. 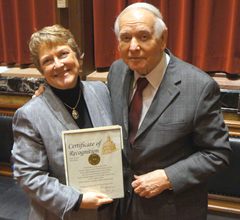 Senator Amanda Ragan with former Governor Robert Ray. Democratic Senator Amanda Ragan of Mason City is the other recipient of this year’s Herbert Hoover Uncommon Public Service Award. Ragan, who is 58, has been serving in the Iowa Senate since 2002. “Charles and Edith believe their mother will be an inspiration for generations in their family due to her journey from being a single divorced mother in college to a state senator in just a decade,” Jochum said. Herbert Hoover, a native of West Branch, Iowa, is the first American president to be born west of the Mississippi River. He was elected president in 1928 and served one term. Hoover gained international fame for managing relief efforts in Europe after World War I.
Heaton photo courtesy of House Republican Caucus Staff, Ragan photo courtesy of Senate Democratic Caucus Staff.